With a website by WebsiteExpress you will have the ability to easily update your website content. After you have logged into your website you can click Edit Content in any of the website content areas and you will see the standard content editor load. Through the content editor you can manage all your content, from text, links and images to advanced tables, html, and embedable code snippets. Here is the content editor. At the top are the 3 rows of tools. Below that is the editing window where you can type and add content. After you have added or updated your content simply click Save and the changes will be saved and made live on your website. Here's an overview of each tool and what functions you can preform by clicking the icon. 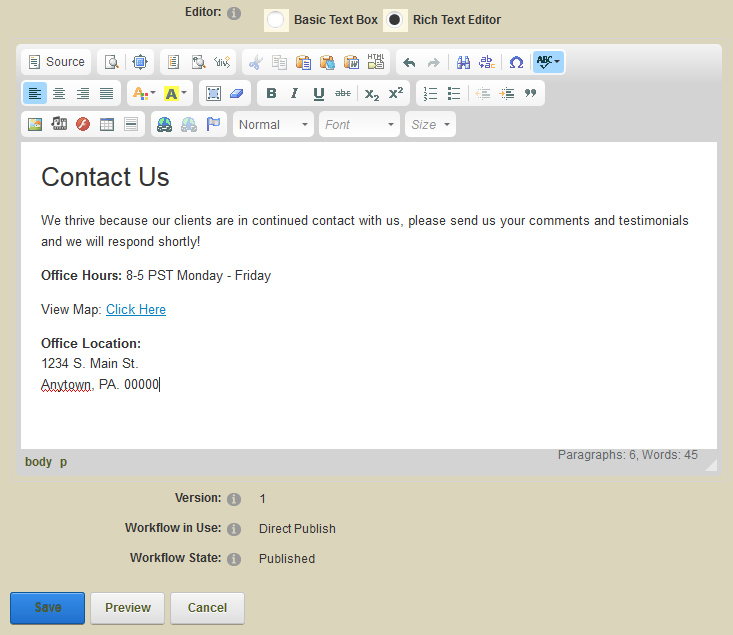 Source - With the source button you can toggle back and forth between the HTML view and the Rich Text Editor view. Typically editing in HTML mode is for advanced users. Preview - This is the quick preview tool. A window will pop up with a preview of your content. Maximize - Enlarge the content editor to fit your entire browser screen. Click the icon to go full screen and then click it again to get back to the normal editor size. Templates - The template tool will allow you to insert a few content templates into the editor, such as text and an image or text and a table. Show Blocks - You can click this tool and see the type of content blocks you have, such as paragraph, div, header blocks etc. This tool is typically used by advanced users. Create Div Container - If you want to put a div around some specific content you can use this tool. This tool is typically used by advanced users. Cut - This is the familiar Cut tool for cutting content to your clipboard. You can simply select some content and then click this tool. Copy - This is the familiar Copy tool for copying content to your clipboard. You can simply select some content and then click this tool. Paste - This is the familiar Paste tool for pasting content from your clipboard. You can simply click this tool and the contents of your clipboard will be pasted at the spot where you have placed your cursor in the editor window. Paste as Plain Text - This is similar to the paste tool except this will remove any style formatting from the content in your clipboard and paste it simply as plain text. Paste from Word - This is similar to the paste tool except this will clean up any content that you are copying over from a Microsoft Word document. It will remove any Word style formatting from the content in your clipboard and paste it as web friendly content. This is always recommended when copying from Word and pasting into the website. Insert Html Code - This button is used for inserting raw html into the content editor without having to go into the source mode. Just place your cursor where you want to insert the Html and then click this button and paste the Html into the window and click OK. This button is used most for inserting embed codes into your website such as YouTube videos. Undo - When you make a change in the editor window and want to revert back, simply click the undo icon. Redo - When you undo a change in the editor window and you want to put the change back, simply click the redo icon. Find - With this tool you can find and select specific text content in the editor window. Replace - With this tool you can find and replace specific text content in the editor window. Insert Special Character - With this tool you can insert hard to find characters into your content such as copyright symbols ©, trademarks™, fractions ¼ and lots more. Spell Checker - This tool will spell check as you type. It is enabled by default and will put a red squiggly underline under words that are miss-spelled. You can disable it or change the options by clicking on the icon. Align Left - This will align your content to the left. By default content is always aligned left. Center Align - This will center align your content. Right Align - This will align your content to the right. Justify Align - This alignment tool will automatically space your text so that it fills the entire line and keeps the sides of the text blocks perfectly square. This text alignment is often seen in print materials and books. Text Color - You can change the color of your text with this tool. Simply select the text and click the icon and choose a color. Text Background Color - You can change the background color of your text with this tool. It is often used for highlighting text. Simply select the text and click the icon and choose a color. Select All - This tool will select all the content in the content window. Remove Format - This tool will remove any styles and formatting in your content such as colors, bold, and italics. Simply select the text and then click this tool to remove the styles so that only the plain text remains. Bold - This is the familiar Bold text tool. Simply select your text and click the icon to bold it. You can also select bold text and click the icon to unbold it. Italic - This is the familiar Italic text tool. Simply select your text and click the icon to italicize it. You can also select italicized text and click the icon to unitalize it. Underline - This is the Underline text tool. Simply select your text and click the icon to underline it. You can also select underlined text and click the icon to remove the underline. Strikethrough - This is the Strikethrough text tool. Simply select your text and click the icon to strikethrough it. You can also select strikethrough text and click the icon to remove the strikethrough. Subscript - This is the Subscript text tool. It will make the text smaller and lower on the line. Simply select your text and click the icon to make it subscript. You can also select subscript text and click the icon to remove the subscript. Superscript - This is the Superscript text tool. It will make the text smaller and higher on the line. Simply select your text and click the icon to make it superscript. You can also select superscript text and click the icon to remove the superscript. Numbered List - Use this tool to insert or remove a numbered list. Bulleted List - Use this tool to insert or remove a bulleted list. Decrease Indent - Use this tool to remove the indent from indented text. Simply place your cursor in the indent and click the icon. Increase Indent - Use this tool to add an indent to the text. Simply place your cursor at the begining of the text line and click the icon. Block Quote - Turn a paragraph into a block quote with this tool. Simply select the paragraph and click the icon. You can remove the block quote by selecting a paragraph that has block quote styling and clicking the icon. Image - Use this tool to insert an image into the content editor. Simply place the cursor where you want to insert an image and click the icon. A dialog box will pop up where you can insert an image URL or browse the server and pick one from your website or upload an image. Embed Media - This tool provides another way to embed media into your content. You can click this tool and paste a URL from one of the supported sites (e.g. YouTube, Flickr, Qik, Vimeo, Hulu, Viddler, MyOpera, etc.) and it will generate the embed code. Flash - Use this tool to embed a flash file that you have uploaded to your website. Table - This tool will allow you to create a table with rows and columns. Insert Horizontal Rule - This will insert a divider line and can be used to segregate content. Insert Link - Use this tool to link up text to a web address location. Simply highlight some text and then click the icon and type in the URL or web page address and click ok.
Unlink - This tool will allow you to remove a link from your content. Simply place your cursor in the link and then click the icon to unlink it. Anchor - Use this tool to create an anchor link in a specific location on your web page. This will allow the user to jump to specific places within your page. This tool is typically used by advanced users. Paragraph Format - Use this tool to add header tags to your content or remove header tags and paragraph formats. You can select the first title on your page and give that a heading 1 format and then select a subtitle and give it a heading 2 format. Remove the format by selecting the text and clicking normal. Font Family - Use this tool to select the font family for your text. Simply select some text and then choose a font. Font Size - Use this tool to adjust the size of your text. Simply select some text and then choose a size.